It has never been easier to improve the accessibility of your website, through the new feature added, the links are now immediately meaningful to robots and users alike. RSSeo! will still remain a SEO oriented component. The custom SEF applies on a per single URL basis and not hierarchically throughout all further routing of the specified URL. Google keywords using the Google Search Console. 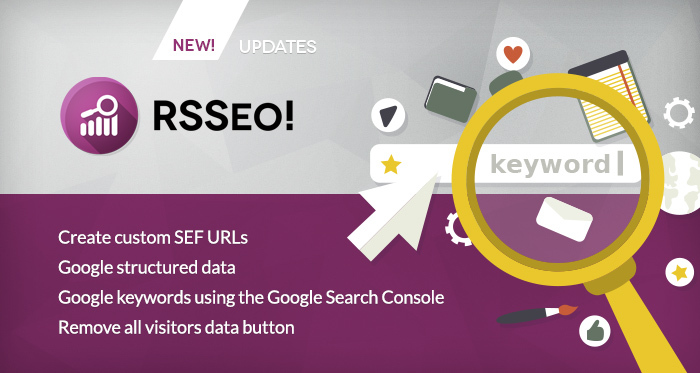 Monitor keywords and import your Google Keywords data from a selected website, you will now see a detailed dashboard including your keyword's data. Expired subscriptions can be renewed with a 30% discount (this discount is applied automatically).